The ultimate way to invest in the Green movement is to maintain what we have. Fortunately, in Oak Park and River Forest we have a wealth of traditionally designed residential architecture. These structures because of their quality, flexibility and character are great candidates for renovation and additions. The conventional houses tend to be simple in plan and shape. Most are rectangular and compact, a form that encloses the most amount of interior space with the least amount of exterior wall. The form is ideal for adapting and making changes. Preservation is about change. Our buildings need to adapt to fulfill the needs of our changing population. This is the only way they will survive. There are many opinions on this issue and how our community can adapt and respond. To that end, I spoke with a few of our fine local architects and these are ideas that they offer. Frank Heitzman: Jim Cavallo from Downers Grove did an energy audit on our home. By examining our past gas bills, Jim found that it takes almost twice as much gas to heat our house than average. Jim installed a fan in the back door which pressurized the house. He determined that our house has very high air leakage, which is the biggest cause of excess heating bills. Jim used a portable infrared heat detector where he could pinpoint areas of major heat loss. He provided a detailed list of recommendations which included adding more insulation in the attic and insulating the perimeter of the basement with a foam type of insulation which would also seal the worst leaks. Cost of the audit was $400.00 — the wisest investment we ever made. Mark Nussbaum: There has never been a better time to replace your aging HVAC system with a new highly efficient geothermal HVAC system. 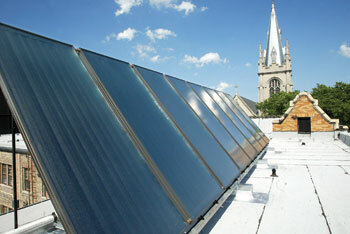 They work great in this climate, can be installed in very small yards, save about 50 percent of energy costs, and currently are being extended a 30 percent federal tax credit through 2016 for the entire system installation, which is roughly the differential cost to a traditional system. Christopher Goode: Most Oak Park houses are particularly suited to the installation of rooftop solar panels. As most of the residential streets run north-south with lots and houses oriented east-west, the roofs are ideally angled toward the south to collect sunlight (and to deflect wind from the north). Each house could provide most of their own hot water needs and perhaps much of their electricity from the sun (without the panels being too noticeable from the street). These photo-voltaic electrical panels could be connected to the electrical grid and reduce the need for power from Commonwealth Edison’s fossil fuel or nuclear plants. Perhaps these home systems could be combined into a neighborhood or municipal system to allow battery storage for night use and possible sale of energy credits. Chris Hamer: The greenest things we can do in our homes are also the hardest. Turn down the thermostat in winter and turn off the AC in summer. Turn off lights and unplug appliances when not in use, etc. These things really make a difference in both your carbon footprint and in household energy expenditures. Unlike other green investments, the payback is immediate.